The pruning workshop on Saturday was informative and timely. The winter pruning season is upon us and my wife and I have some work to do but have been hesitant to “make the cut”. The speaker , Ann Ralph had such a wonderful approach to the subject and gave the group hands on lessons in pruning various types of fruit trees. Ann is the author of Grow a Little Fruit tree and has a long career in the Nursery business. It was hosted by Sustainable Solano through Benicia Community Gardens. 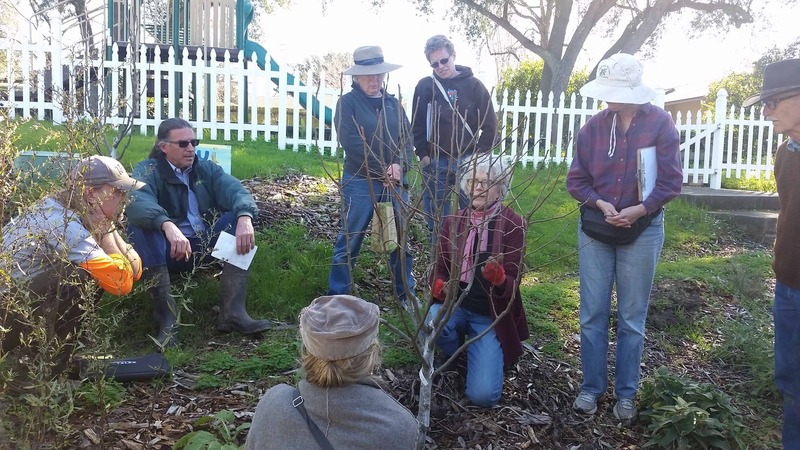 The workshop took place at the Benicia Community Orchard on a brisk February morning and this wonderful outdoor experience was part lecture and part story telling. Ann brought my rough understanding of pruning into focus. I had a sense that pruning was an important part of keeping a fruit tree productive but learned the how and why of it. Ann broke it all down into simple and practical steps that anyone with a fruit tree of any age could perform. There were folks from Vallejo and Fairfield that brought the discussion around to growing patterns from other parts of the county. I was particularly interested in her promotion of the first “knee cut”. Others in the group knew what that meant and were just as horrified as Ann herself was when she was told to perform this on “all bare root trees that left the nursery”. In fact she says that she refused to do it! I hid the fact that I didn’t know what all this meant, but for me this pruning workshop just took an intriguing turn like an Agatha Christie novel. My curiosity did push me to raise my hand and ask Ann to explain to me in more detail about this mystery “knee cut “. I was to learn how this dramatic cut really does set the stage for a future tree that produces a better crop of fruit. But I was unsure if I could do it to one of our freshly purchased bare root asian pear trees. This hard pruning technique that was once ridiculed by nursery’s throughout California is now a standard practice for many or a suggestion given to those purchasing bare root trees from Bay Area nurseries. The group learned how very common sense pruning can be and some tricks that are counter intuitive. I look forward to taking the techniques learned from Ann to promote stronger, more fruit producing branches in our little back yard fruit orchard.